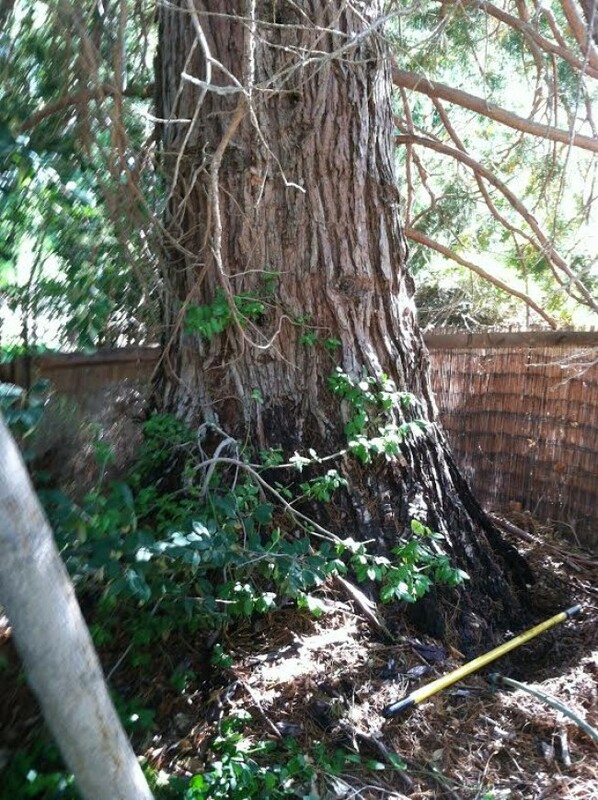 Thanks to John Ems for sending us this picture of his "fat" giant sequoia tree in Alta Loma, California. Thanks to Mike Kern for sending us this image of a giant sequoia growing in Lake Arrowhead, California. According to Mike, it looks like it is growing without any supplemental irrigation. 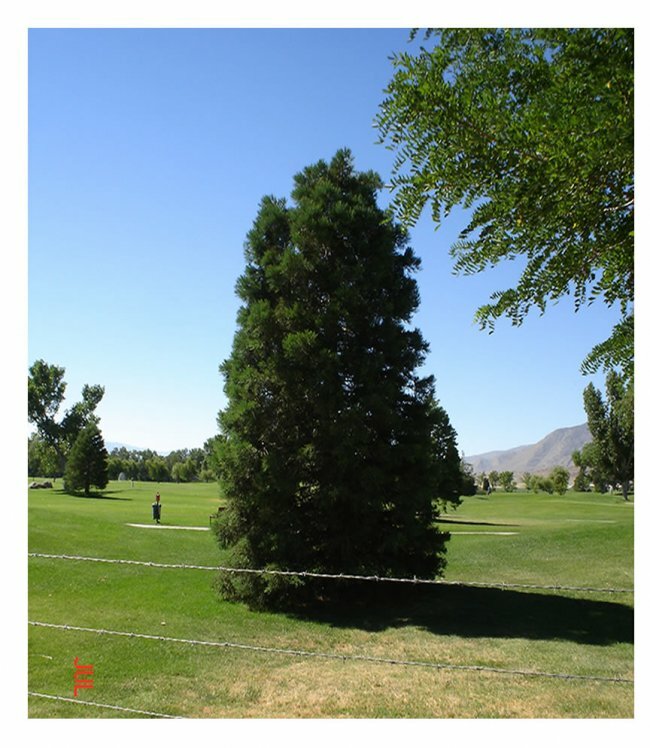 This giant sequoia tree was purchased from our nursery on 11/28/2011. It is still growing well in September 2016 in Castroville, California. Thanks to Jim Kimball for sending us this update on his tree. Thanks to Jim Williams for an update of the tree he planted in 2008. See the photos below for previous pictures. 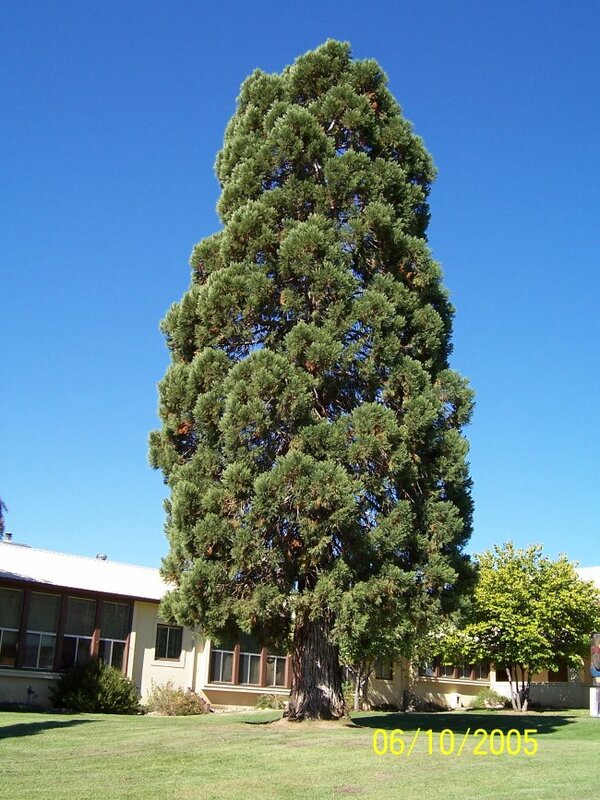 "Here is that little giant sequoia I bought from you years ago. Not so little anymore, and neither is my daughter standing in front of it. The tree has nicely blocked out that ugly air conditioner in the old photo. I've been fertilizing generously with Dr. Earths organic fish emulsion granulated lawn fertilizer. The tree seems to favor it. I hope you enjoyed the update!" Photo taken Sunday May 31 2015 in Modesto, California. View of Jim Willams tree in Modesto from afar. We have hundreds of Giant Sequoias in our city. They do quite well here until they suffer from lack of water once they reach about 50 feet or so. I've seen a few dead ones but most people take care of them. Mine are averaging about 3 to 4 feet of upward and outward growth per year. I top-dress around my trees with homemade compost and fertilize moderately. They get watered every other day on average. 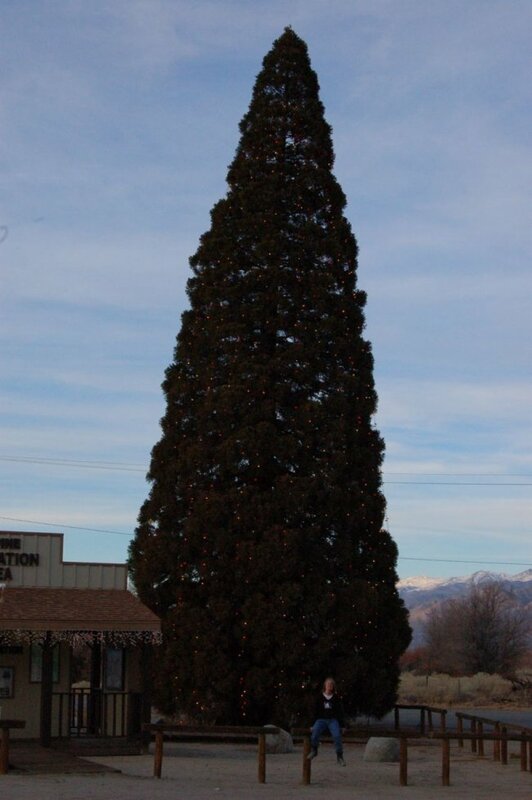 Thanks to Josh T. for sending us this image of a giant sequoia tree that was planted by his grandfather in Bishop, California. 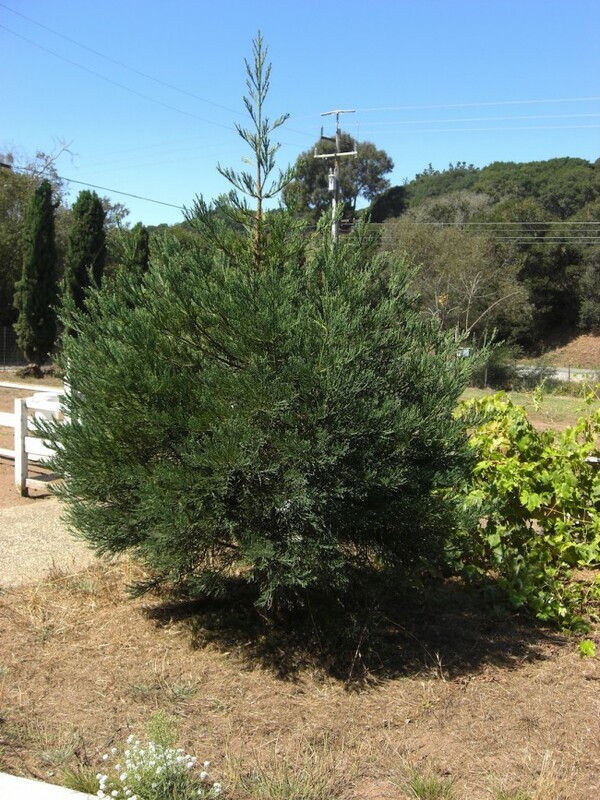 This a photo of one of the trees I purchased from you in October 2008 and is planted on my property on Palomar Mountain, CA. My fastest growing and healthiest tree! - from Jim Hamerly. Taken in 2011 purchased from our nursery in 2008. This is the tree in 2012. Inyo county courtyard giant sequoia tree stands notably to the north of the building on January 1 2012 taken by Judy. The county located east of the Sierra Nevada mountains grows many beautiful giant sequoia trees. They are very evident in the winter amongst the deciduous trees. Inyo county courtyard giant sequoia tree close up taken January 1 2012. 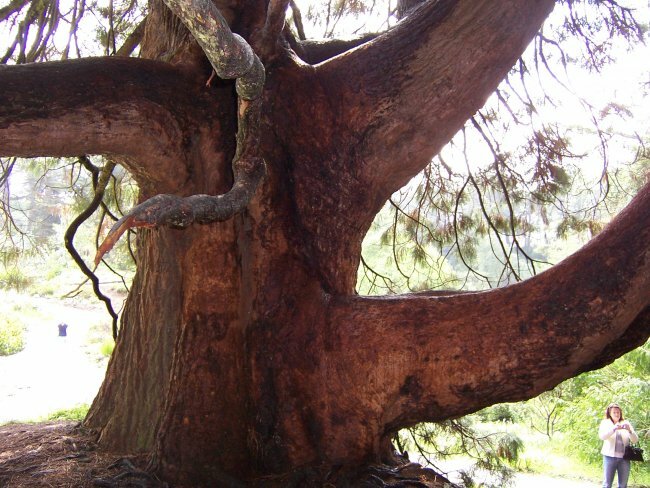 Thanks to Josh T. for sending us this image of the trunk of a giant sequoia tree that was planted by his grandfather in Bishop, California. 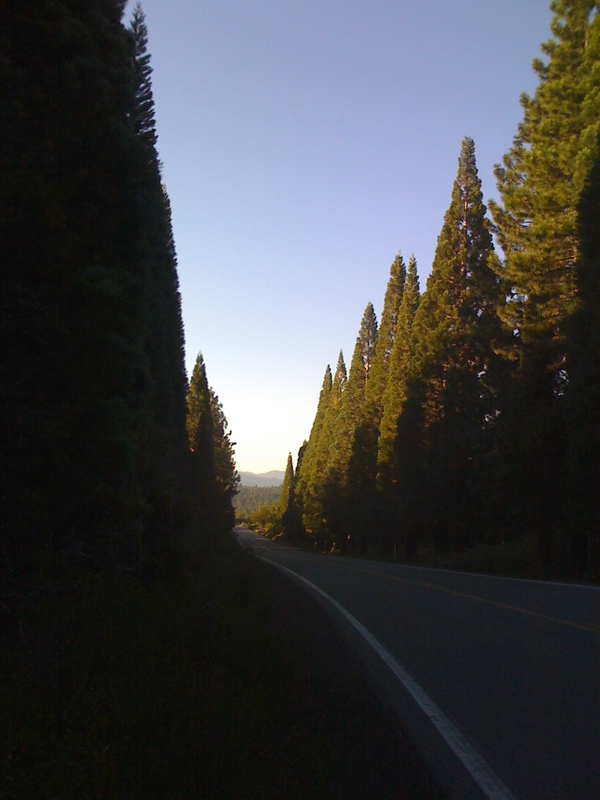 The road leading to Mount Shasta from Weed in northern California offers the traveller a chance to drive through a beautiful demonstration of giant sequoias lining the highway on both sides. There are at least 100 along this road at least 120 feet tall.This shot was taken in the morning of August 17 , 2010 about 7:30. 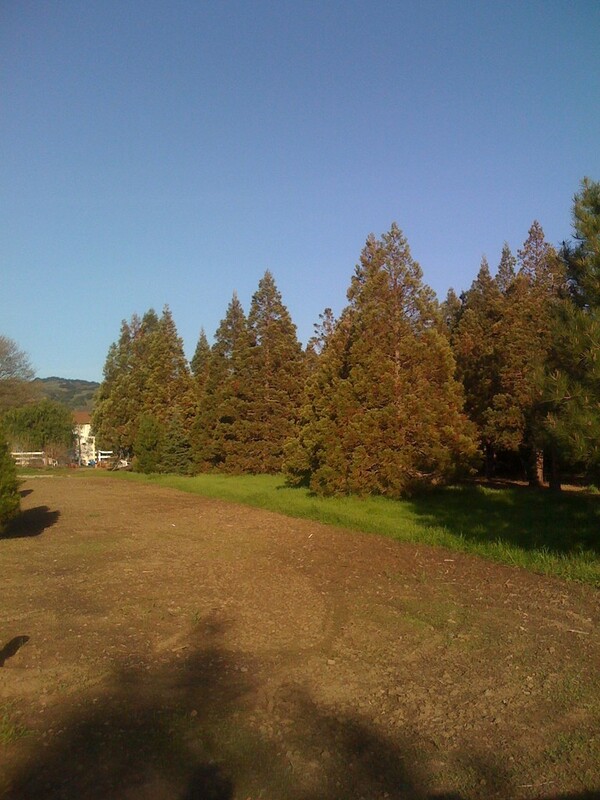 The town of Walker's small park has some awesome giant sequoias which were planted in memory of special local Lions club members many years ago. Walker is in Antelope Valley north of Bridgeport. It is a high arid desert region towards the Nevada border. 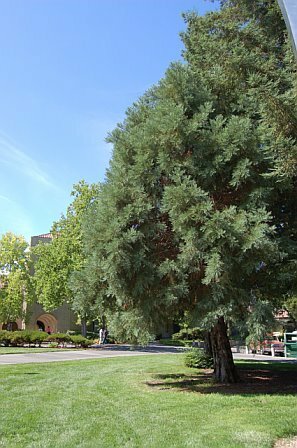 This Lee Vining giant sequoia grows within a parking lot with blacktop surrounding its roots. It is a few miles from Mono Lake, a high alkaline region. Lee Vining is an eastern California town. Taken in June 2008. Off of highway 101 is a sample of beautiful California native giant sequoia trees in the landscaping. 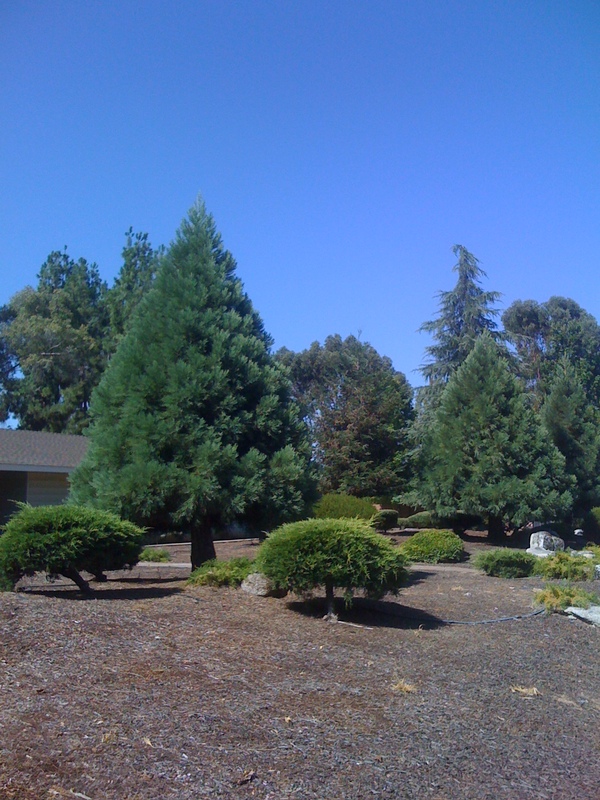 This beautiful row of four giant sequoias is located in Madera County on Adobe Way. They are watered regularly on drip irrigation. Los Altos Santa Clara tree - This tree is in an older neighborhood on Sylvian Way in Los Altos, Santa Clara County. It is about 75 years old. Big Pine, California trees - This is one of the many groups of giant sequoias in the Owens valley area which are about 75 years old. The group here is at the Big Pine school district. The Owens valley is on the east side of the Sierra Nevada range. Bishop Golf Course tree in Inyo county. 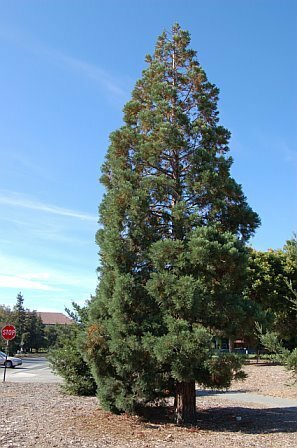 San Diego County giant sequoia - You asked me to send a shot of the sequoia in San Diego County located on the Sunrise Highway along the way to Laguna Mountain in front of the post office and convenience store. This is about 45 minutes east of San Diego. Central High School ,East Campus, located in Fresno, is growing the state tree for the students to admire. The campus is west of the native groves of Sequoia National Park. A home in the Atascadero area of the Central Coast of California. Jackson tree - Cindy is showing off the tree given to her husband for Father's day as a little XL seedling from Welker's Grove Nursery four years ago. It is planted in their yard in Jackson, located in the gold country, Amador County. This row of giant sequoias are growing along San Marcos Road near Highway 41 in Atascadero along the Central Coast of California. This small grove is growing in the southern part of Lee Vining in the Eastern Sierras at a mobile home park. Mono Lake is just to the east of this area. 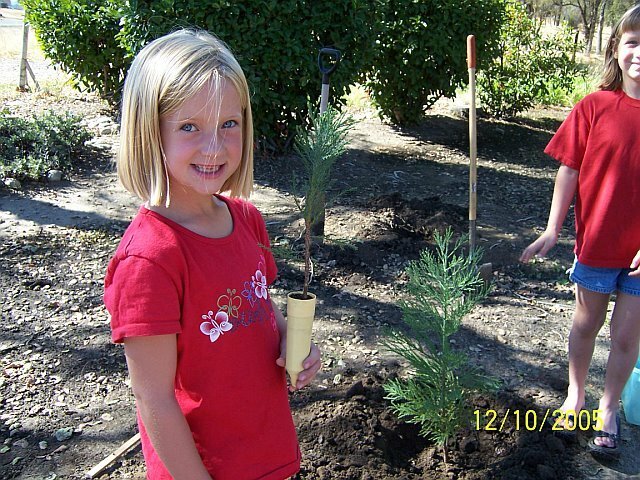 Children from Prather, California planting giant sequoias in their church landscaping in the foothills of Fresno County. This was planted in 2006. Tree was 2 years young at the time. As of 2017, they are about 13 feet tall. 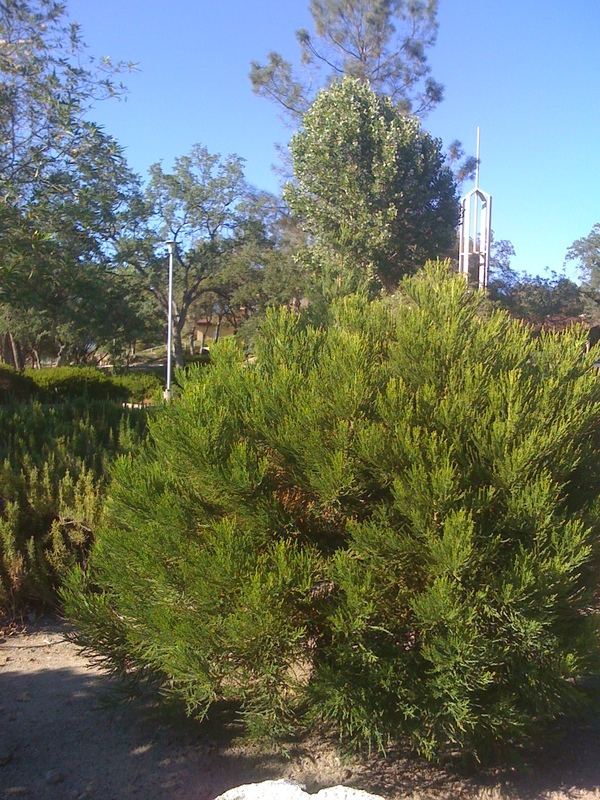 As of 2011, the giant sequoia trees are growing healthy with regular watering from a drip system after being planted by children of Prather in the church landscaping. This particular tree has more of a ball shape but good sized trunk after some damage to the side. Sierra High School giant sequoia grove in Fresno County at 1,800 foot elevation. Students are able to enjoy their state tree each day on this mountain campus. You sold me ten - seven are still living and this is my KING... about two years old! In Diamond Bar right off Highway 60 . I planted them all real close thinking that that would create some natural competition and the strongest would survive. Michael Fisher is located in Diamond Bar, east of LA, near Pomona. He has the trees growing healthy with driplines. Thank you Michael! These giant sequoias are in an older portion of what appears to be an old Christmas tree farm. This is east of Gilroy on Pacheco Pass. It is in Santa Clara County. It is right off of very busy Highway 152. San Francisco Golden Gate Park - This is the trunk of the tree the three sisters were sitting in with a fourth sister Gwen standing below. This is located in the 55 acre Botanical Gardens near the DeYoung Museum area. Amador Golf Course tree is growing in Mace Meadows Golf and Country Club in Amador County. Auberry Elementary School of Fresno County has a couple of awesome giant sequoias in their front landscape for the children to really know one of their state trees. This tree was planted in 2003 when it was about 1 ft tall. It is growing in Juniper Hills, a high desert area overlooking the Antelope Valley which is near Palmdale. Elevation at 5,000 ft. 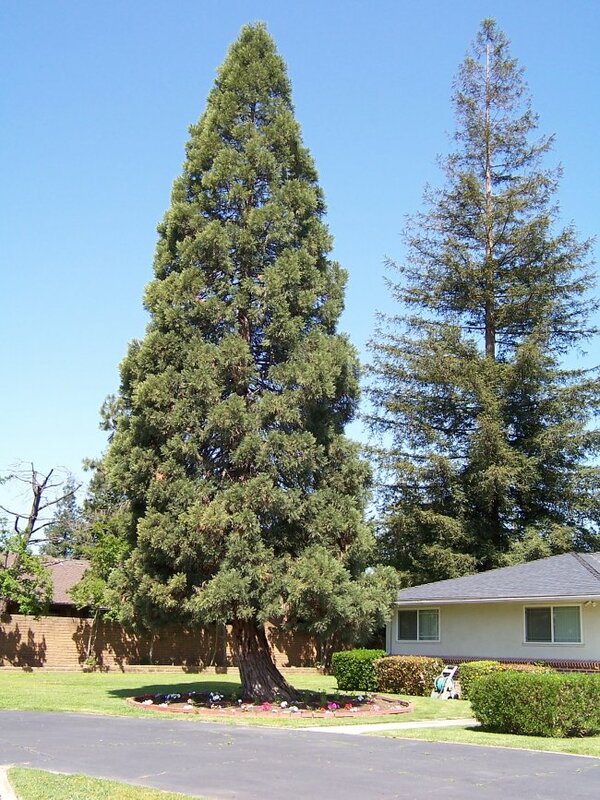 This is one of the larger Sequoiadendon [ I] know of in a municipal zone. It is located in Washington Park, Burlingame, California. It is at least 8 feet in diameter, but only 100+ feet tall. 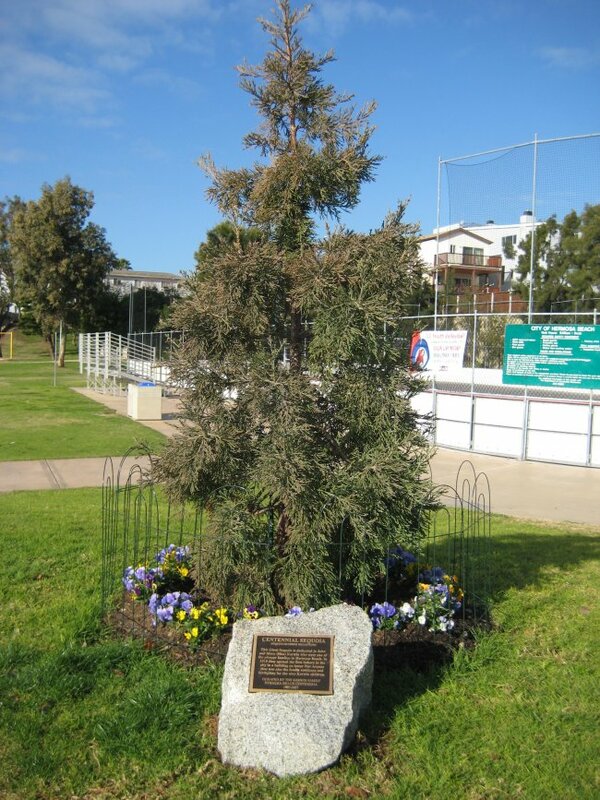 There is also a Metasequoisa planted here in 1952. 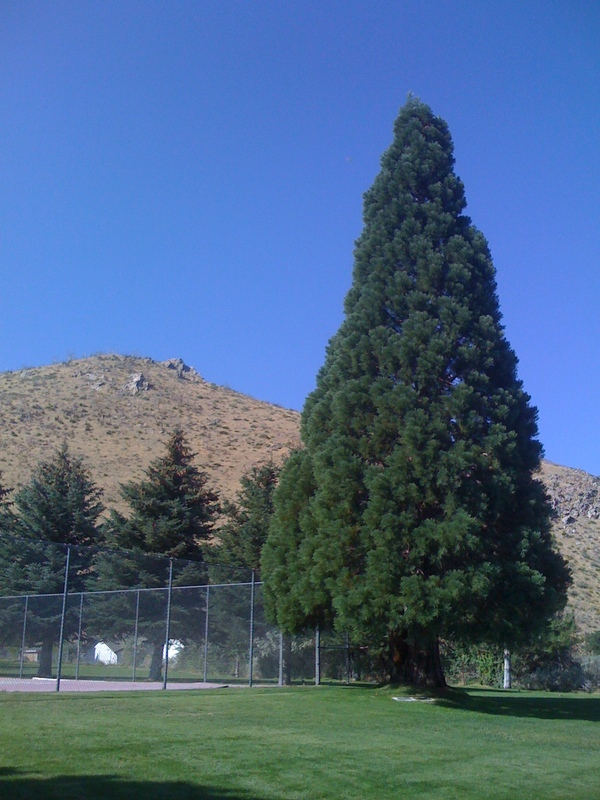 Roosevelt tree located in Big Pine of Inyo county. This giant sequoia tree was planted on July 23, 1913 reportedly to commemorate the opening of Westgard Pass to automobile traffic. The tree was named in honor of President Theodore Roosevelt. El Cerrito (north of Oakland) is graced with this tree planted in memory of David L. by Gayle. She fills the clay pot with water to let it perculate into the soil. It was planted in the ground in 2008 after spending a few years in a 5 gal. pot cared for on the porch. You can see it has gained height and girth in its new location in the backyard as of 2011. 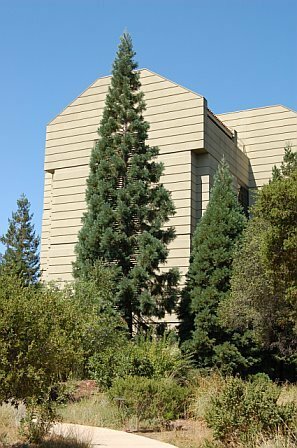 Stanford University Keck Bldg trees - These giant sequoias are at the east end of the Keck Science bldg just south of the Rodin sculpture garden. The older of the two trees towers over most all the beautiful trees on campus. Located in Santa Clara County. 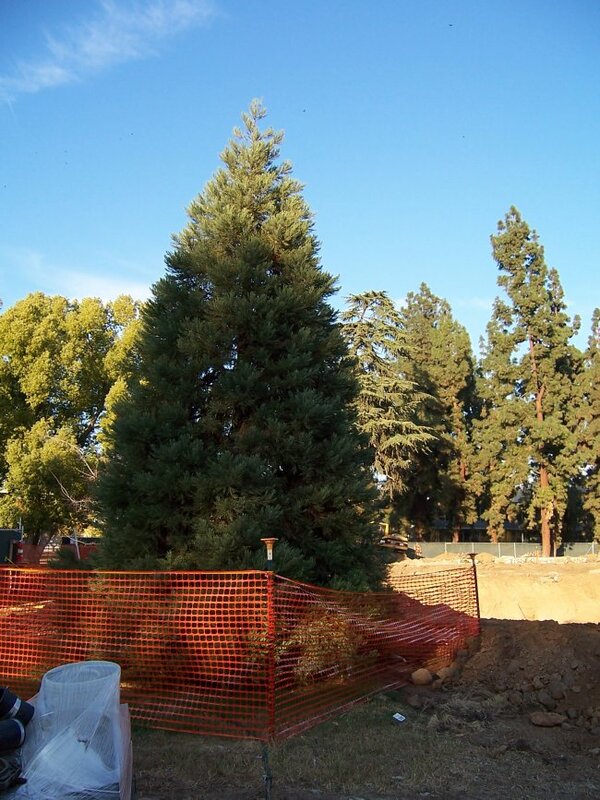 Hermosa Beach - We finally got our giant sequoia planted in a small park called South Park in the City of Hermosa Beach. The tree was planted as a part of the Centennial celebrations for the city incorporation in 1907. Tree is dedicated to grandparents. Cal State University Fresno - This tree planted in 1990 is well protected from the construction of their new campus library. It was planted in memory of Gayle, the mother of Gene, one of the University's grounds managers. West of Kings Canyon National Park, a church in Reedley is graced with a giant sequoia in their landscape. 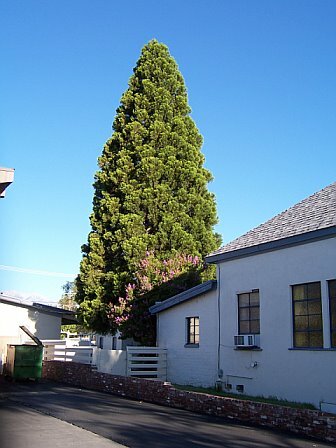 Bishop - This giant sequoia sits in the back courtyard of the First Presbyterian Church located off Main Street in downtown Bishop, Inyo County. A fine healthy tree on the property of an Atascadero landowner. Mt. Laguna giant sequoia - I took this picture of a Sequoia on Mt. Laguna in San Diego County and attached a Google Earth KML file that if opened in Google Earth will show a tack in the location of the tree. It's out in the wild. 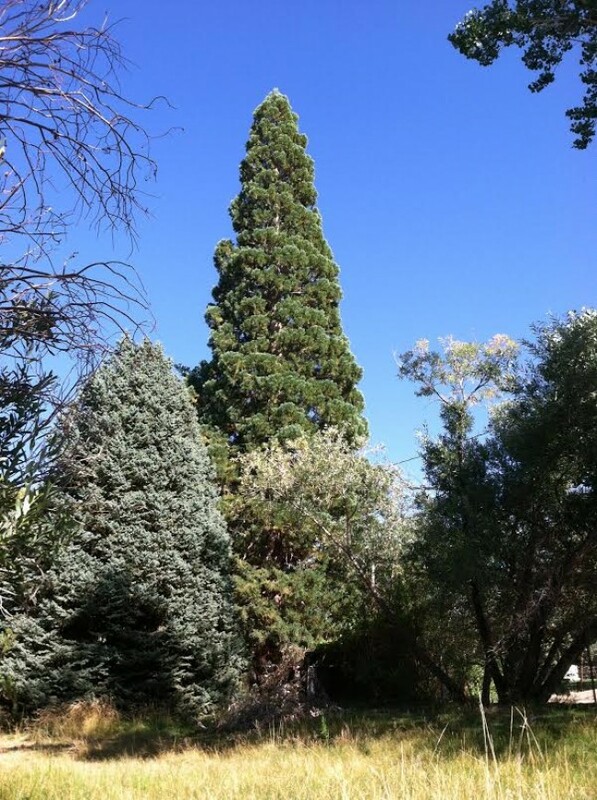 Phil Goldcamp sent us this picture of his giant sequoia tree. He planted it as a 4’ tall living Christmas tree not knowing what kind of species it was and it is now approximately 15 years old and 50’ tall. Phil said, “We had no idea what it was when we planted it; nor until about 7 years into its remarkable growth when we had an arborist come by to look at other concerns, and he identified it immediately. I thought he was pulling my leg, and said, "yeah, right". He assured me he was not kidding”. Thanks Phil for sending us the picture and the interesting anecdote to go along with it. This specimen tree is showing amazing new growth for season 2015 in its location on the San Francisco peninsula west of the SFO airport. Even with the drought conditions of California and no visible watering system -- the tree has a solid trunk and most likely was planted and cared for many years ago in San Bruno. It is locate on the grounds of Allen Elementary school off of Linden and Angus. Its early care has developed a strong trunk base establishing its good health. 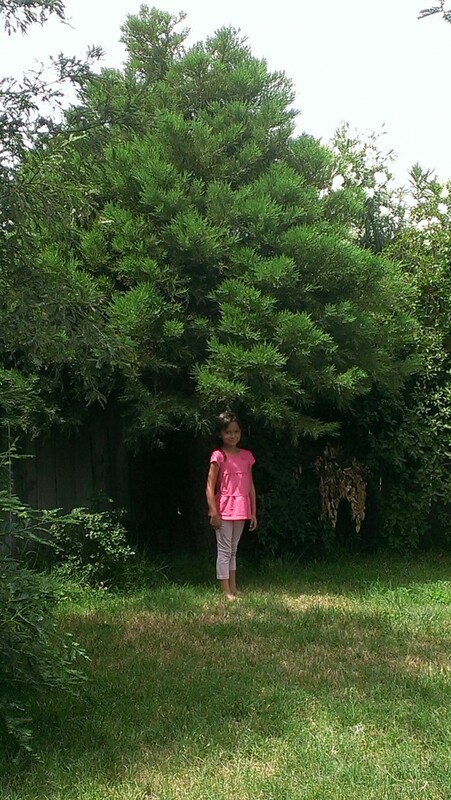 There is some brown out, (June 2015) but tree appears dense and healthy.